There is no mistaking it. The crisper, cooler air hints at it, but the once vibrant green leaves transforming to the telltale hues of autumn give it away. Nostalgia begins to seep into every room of the house as parents prepare their offspring to fly solo from the safety of their protective nest. Expat parents have even more to think about when sending their children off to college, whether it be back to the home country or that of another host country. Our children are unique. They know it. They’ve most likely used that angle on their college admissions essays to point out the diversity they will undoubtedly bring to the campus of their choice. Their life experiences have been very different from most of the peers they will be surrounded by on their college campuses. The globally mobile life style of global nomads/third culture kids (TCKs), as we refer to them, brings with it a plethora of gifts, skills and benefits including a broad world view, languages, and cultural competencies. But, as with anything, there is a flip side to moving across cultures during those critical developmental years (birth to 18). There are unique challenges TCKs must face on top of the usual transition issues they share with their domestic peers when entering college. There are four major insights that can help TCKs as they transition out of the expatriate culture. TCK IDENTITY DEVELOPMENT Dr. Barbara Schaetti, who has done extensive research on TCK identity development, explains that, particularly upon repatriation, TCKs “wake up to the fact that they are different from others.” She calls this an “encounter experience.” If they understand that it is their international experiences that make them different they can come to grips and be comfortable with their differences. TRANSITION CYCLE Every first year college student is making the transition to a new life stage as an independent adult, but global nomads and foreign students have the cultural adjustment to make as well for even the home country culture can be foreign to TCKs in many respects. Understanding what takes place in each of the stages not only prepares them but helps them to appreciate that it is normal and temporary. Involvement Stage– this is life as the TCK knows it. She is involved in the community, has friends, roles, responsibilities, and feels a sense of belonging. Leaving Stage – begins the moment she is aware of an upcoming change. For the college-bound TCK this could be from the time she is making college visits to application time or to the decision time. There is a separating and distancing from roles, responsibilities and relationships. There are mixed emotions – sadness mixed with anticipation. Transition Stage – starts the moment TCKs arrive in their new environs. This stage is characterised by utter chaos. Everything is new and different. There are no routines or structures in place. Entering Stage – begins the moment the TCK either consciously or unconsciously decides she is going to settle in and become a part of this new place. Feelings of vulnerability, self-doubt, anxiety, and ambiguity may still be hanging on from the transition stage, but she is committed to sticking it out and making it work. Re-Involvement – when the TCK realises, usually after a long school break, that this new place feels more like home. She has relationships, roles, and responsibilities and feels affirmed once again. GRIEF The high mobility lifestyle of a global nomad means there is a lot of separation and loss. When we lose people, things and places that are important to us we need to grieve over them. Allowing grief to run its course is considered ‘good grief.’ When TCKs can put a name on their loss, spend time with it, and mourn over it, they can come to closure and move forward. Being intentional with their good-byes helps confront the losses. RELATIONSHIPS The most common complaint of TCKs at college is feeling like they don’t belong, don’t fit in, can’t connect with their peers. There are many reasons for these disconnects – having no point of reference for one another, lack of shared experiences, they build their relationships completely differently - but they need to find commonalities. They can be reminded that they are all going through the first year experience together. THE GOOD NEWS Not every TCK is going to have a difficult time making the adjustment to college/university. In fact, because they are used to change they often tend to fare better than many of their domestic peers. But for those who are not prepared, it can be difficult to recover from the unexpected challenges. Advance preparation can significantly ease the adjustment process and allow these wonderfully gifted students to use their international experiences to make the most of the college years and beyond. *Suggested reading on TCK identity development can be found in Raising Global Nomads, by Robin Pascoe. The Global Nomad’s Guide to University Transition is a guide book to help students who have been living outside their “passport” countries understand what takes place in re-entry and/or transition and gives them the tools and strategies they need to not only survive but to thrive in the adjustment. This book addresses the common issues students face when they are making the double transition of not only adjusting to a new life stage but to a cultural change as well. Parents will appreciate the chapter dedicated to how they can come alongside their students, prepare them for the journey and support them throughout this major transition. Set in the heart of the West End along Pall Mall, only a short walk from sight-seeing central (Trafalgar Square, Buckingham Palace…) is the Balcon Restaurant. There is something very glamorous about this newly refurbished restaurant with its distinctive Parisian Chic atmosphere. 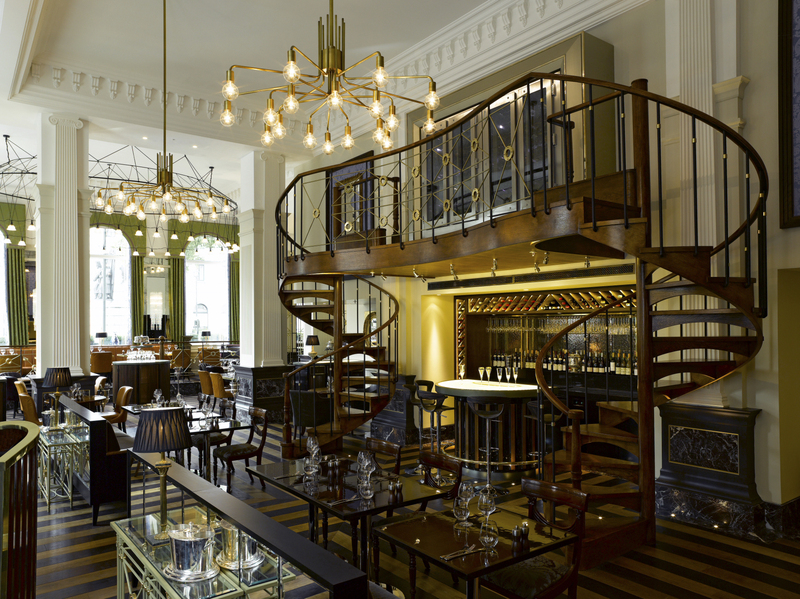 The champagne bar in the centre of the restaurant is a particularly striking feature, framed by two ornate spiral staircases leading rather appropriately to a balcony which houses the champagne collection. There is a definite sense of occasion about this restaurant which makes it just as ideal as the setting for a cosy meal for two, as it would be for a larger group celebration. The warm summer’s evening outside was echoed inside by the genuinely warm welcome we received. We sat down to study the menu and enjoyed some particularly tasty nibbles with our pre-dinner drinks. The menu offers a broad range of French inspired dishes, from the ‘Charcuterie’ with its selection of cold meats and homemade terrines, to the ‘Rotisserie’ offering roast meats, trimmings and accompanying sauces. Not forgetting some traditional casseroles cooked ‘en cocotte’. I chose a Roasted Goats Cheese and tomato salad with basil, balsamic vinegar and olive oil to start. My partner opted for Green Asparagus, soft boiled egg and Maltese orange sauce. We both enjoyed our dishes immensely. I particularly liked the variety of tomatoes which offered an artists’ pallete of colours including, amongst the various shades of red, some really flavoursome green tomatoes. The roasted goats cheese provided the perfect creamy antithesis to the crunchy tang of the tomatoes. Starters range in price from £6.75 to £11.50, with Charcuterie options up to £17.50. Choosing a main course was a hard task. I could happily have chosen at least one dish from any of the aforementioned sections of the menu, but in the end I narrowed it down to the ‘Pan and Grill’ offering dishes including Organic Salmon Fillet, Scottish Beef Burger or Cod loin wrapped in Mas ham. I finally decided on Calamari stuffed with aubergine and rice, with seared scallops and sweet corn puree. My partner chose a house specialty: Scottish Beef and Foie Gras Cottage Pie with chanterelle mushrooms. Main courses vary in price from £12.00 to £25.50. My partner could barely contain his enthusiasm for the Beef cottage pie with a side of sauteed green beans and spinach. He ate every last morsel, allowing me only the tiniest amount to taste! This would be my ultimate choice on a cold winter’s evening, but for him this is a winner in every season. I chose to pair my stuffed Calamari main course with Sweet Potato fries. I really enjoyed the contrasting texture of the melt in the mouth scallops, with the Calamari. I am not sure that sweet potato fries is the ideal accompaniment for such a sophisticated dish, but I love them so much I couldn’t resist - and they certainly did not disappoint. Struggling with the wine menu, in view of our very different main course choices, our waiter recommended a bottle of ‘Terroirs de Chablis’ Chardonnay to accompany our meal. Crisp, and very quaffable; it was the perfect summer choice. As you’d expect from a French restaurant there is a good range of wines to choose from, including dessert wines. The dessert menu offers some really interesting options that provide a refreshing break from the norm. Ranging in price from £5.00-£8.00, choices include Lemon and Rosemary Cake with Mirabelle plums, Cardamom roasted peach melba or Blackberry financier with green apple sorbet, to mention a few. However, both my partner and I had been admiring the impressive ‘Showcase of pastries’ which we had noticed being wheeled to several tables during our meal, and so our curiosity got the better of us. The Parisian pastries are mini works of art. We made our selection and found that indeed they did taste as good as they looked! Fairly small in size, they offer the perfect sweet ending to a meal, if you haven’t quite got room for a full-on pudding. The Balcon has certainly managed to bring a little French chic into the heart of London, but not too much to alienate fans of fine British produce and cuisine, with their offerings of ‘Scottish beef’, ‘Devon Lamb’ and ‘Traditional Pork Pies’. This restaurant manages to embrace the Best of British and French, the perfect ‘Entente Cordiale’! For Americans, making a new life in London presents all kinds of new challenges. Luckily the land of fish and chips also has great American styled restaurants! London’s social landscape is vast and as an American in a foreign land it is important to become acquainted with a new way of life. In a way, an American going to London could be viewed as a rite of passage. Britain is after all the foetus of American society. America was largely born of Britain and other European colonies but first and foremost Britannia. America’s independence was also a result of its rebellion against Britain and thus some might say that America and Britain share an uneasy friendship. But this isn’t a history lesson. Instead the aim here is to make you, the newly arrived American as comfortable as possible in your ‘old’ home and what better way than to provide you with a list of 5 great American styled restaurants and diners? Eat at these places and you’ll find yourself feeling as if you never left home in the first place. The Big Easy: Taking its name from the movie of the same name with former screen siren Ellen Barkin and former all out American hunk – Dennis Quaid, this restaurant is renowned for a couple of things. Situated in Kings Road, London, this 20 year old locale brings great American cuisine to the pellet of anyone with a healthy appetite and need for a taste of home. Of note is their prime Maine Lobster – up to 6 pounds of the stuff. Then there’s their New England clam chowder, jumbo shrimp and Atlantic crab. But the salivation doesn’t stop there. The Big Easy also offers 3 week aged Longhorn steaks, voodoo chicken wings and best of all, peel-off- the bone ribs marinated in a special BBQ sauce. Sporting a vibrant environment, sizeable portions and splendid cocktails, you’re bound to find fun there. All Star Lanes: Talk about your all-American diner, this one tops it off with its own bowling alley. A slight bit of a franchise, you can find these venues in Holborn, Bayswater, Brick Lane, Westfield Stratford City and Manchester-Deansgate. Sporting a much stylised retro look, All Star Lanes brings back the old American tradition of making a night or day of bowling. This is bolstered by good old American cuisine – Southern fried chicken, BBQ baby back ribs, great sirloin steaks and of course, cold beer. So whether it’s a date, a birthday party or simply the need to let your hair down, All Star Lanes is your place. Kids are also catered to and with the wifi coverage, should you get the opportunity to take a break from the kids, you can always enjoy a little flutter on your mobile casino. Ed’s Easy Diner: A throwback to the 50s when everything had an air of optimism, this American themed diner has all the bells and whistles to engulf the imagination and transport you back in time. The retro fitted read and silver theme will appeal to the eye and the high bar stools are pretty nifty too. Plus the menu is ticks all the boxes of an old school diner – burgers, hot dogs, shakes and fries – everything the body needs. Ed’s is a franchise so you’ll find it all over the UK. Goat: Looking for New York Italian inspired dishes? Look no further than Goat, formerly known as Goat in Boots. The building itself has a 350 year history and the new owners have refurbished the entire structure and in the process have uncovered that they term ‘original amazing features’. This has all been done to restore strong historical elements of the building. Sporting 3 floors, the bottom is a restaurant named Dine while the upper part of the building serves cocktails and is known as Drink. The interior is a balanced mesh of modern decor juxtaposed with a Victorian element. Pizza’s and steaks are the orders of the day at this Chelsea based restaurant. The Diner: The quintessential location for the all-American dining experience right down to the colour scheme (red, blue and white). A small but formidable franchise, The Diner has diners in Camden, Covent Garden, Islington, Soho, Shoreditch and Gloucester Road. The Diner serves up all the American comfort food that you can handle and the menu throws in everything but the kitchen sink. Chicken wings, burgers, baby back ribs, blueberry pancakes, and the Mexican breakfast pan - the list is endless. It’s the kind of food that won’t have you fighting fit anytime soon but it sure will cure a hangover. Americans ‘will explore the dullest landmarks,’ Terry Eagleton writes in Across the Pond: An Englishmen’s View of America, ‘and labour their way up and down the most unforgiving flights of stairs [,such is] their energy [and] extraordinary … willingness to listen and learn.’ While I would tend to agree with the prolific literary critic’s comments, it is not considered politically-correct to generalise nowadays. As such, I write the below review of an exhibition, which is far from dull and thankfully stairway-free, for those Americans interested in learning about the relatively ordinary roles that their rather extraordinary forefathers performed in Britain during the Second World War. Let us start with the scale of the United States’ military presence in the United Kingdom. It was, in short, immense: approximately three million American servicemen and women flowed through Britain post-1941; 350,000 of those formed the Eighth and Ninth Air Forces and were stationed in East Anglia – ‘the prime site’, David Reynolds reminds readers of Rich Relations: The American Occupation of Britain, 1942-1945, ‘for the bomber offensive against Germany.’ Given that a reported one in seven residents of Suffolk was American, American in Britain readers would be forgiven for thinking that George Orwell’s infamous remark about ‘feeling … occupied’ was in reference to a(n East Anglian) county and not the capital. The U.S. Army Air Force planted its flag in the soil of as many as 160 airfields around the UK during the war so Orwell’s comment, while hostile, cannot be considered mere hyperbole. And, now, thanks to the late Roger Freeman (1928-2005) – the son of an Essex farmer who lived close to the Boxted airfield – and his 15,000 photographs, the so-called friendly invasion is illuminated anew through the illustrations which portray magnificently the 450-000-strong American presence spread across sites official press photographers referred to as “somewhere in Britain.” To mark the 70th anniversary of the U.S. AAF’s arrival at Royal Air Force Duxford, the Cambridgeshire branch of the Imperial War Museum has selected a number of striking photographs from the recently-acquired Roger Freeman Collection to go on display in its most recently-constructed hangar. The exhibition, entitled Somewhere in England: Portraits of the Americans in Britain 1942 to 1945, is only temporary (closing on 31 December 2013 after opening on 14 April – seventy years on, near-enough to the day, from the 78th Fighter Group’s first sortie) but will leave a lasting memory. Most of us think immediately of a pilot when reflecting upon a role within the air force and yet the public relations officer or, say, a parachute packer was as equally important, arguably more so, since greater numbers were engaged in the latter roles on the ground below ensuring that the former, in the skies above, was able to do great work. This is something that exhibition organisers are acutely aware, unsurprisingly, which explains why they are keen to introduce visitors to the varied roles performed by both men and women within the U.S. AAF. I have included the names of those featured in the black and white images in order to preserve their memory and honour, albeit in a very small way, their respective war-time service in the most black and white conflict history will ever likely witness. Among the 30-plus, some previously-unseen, images are a journalist (Virginia Irwin, 1908-1980), public relations officer (Lieutenant Stanley G. Markussen, 1917-1997), barber (Private Oscar Leo Burns, 1917-1971), weather officer (Captain Alexander Sadowski, 1920-2002), adjutant (Captain Edwin G. Caudill, 1921-2012), armourer (Sergeant Leroy A. Nitschke, 1899-1993), chaplain (Captain Edmund J. Skoner, 1912-1988), parachute packer (Technical Sergeant Francis Scott Kee, 1914-1980), intelligence officer (Captain Gordon J. Burns, 1904-1963), runway control officer (Lieutenant Stephen C. Ananian, 1922-), medical corpsman (Sergeant Charles R. Lahey, 1923-1944), members of the ground crew (Technical Sergeant Lester A. Reifeiss, 1918-1979 and Sergeant Jasper Taylor, 1920-1976) – each and every one going about their daily business. Splendid but small, I would not necessarily recommend that American in Britain readers re-visit IWM Duxford for the exhibition alone – not unless they reside in the Cambridgeshire area, anyways. For those who are yet to visit, however, I would seriously recommend visiting – and soon: it is a real treat to go from a little gem of an exhibit in the Mezzanine gallery, located in AirSpace, to the grand American Air Museum at the opposite end of the airfield. As impressive as the housing of the greatest collection of U.S. warbirds on display outside America is, though, it is the (Counting the Cost) memorial that lines the route to the entrance – which honours the 26,000 American airmen who gave their lives during the Second World War – which impressed me greatly. For those moved, saddened – humbled even, I would suggest driving the ten-odd-miles to Madingley American Cemetery. I say this for the simple reason that while exhibition-goers are told the body of medical corpsman Sergeant Charles R. Lahey was later repatriated it is only here, standing in the grandest cemetery dedicated to U.S. service personnel in the UK, that civilians – American in Britain subscribers and British admirers of America alike – can truly appreciate the ultimate dedication of those from the New World who came “over here” to redress the balance of the Old. Somewhere in England: Portraits of the Americans in Britain 1942 to 1945 runs until 31 December 2013 and entry is included in general admission (£12.25-£17.50). Imperial War Museum Duxford is open daily 10am-6pm (4pm from 27 October) but closed 24, 25 and 26 December.